Book Drunk: Reviewed: A Little Something Different by Sandy Hall. 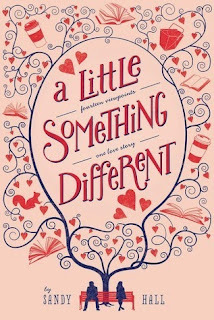 Reviewed: A Little Something Different by Sandy Hall. A Little Something Different by Sandy Hall was published by Macmillan Children's Books on August 28, 2014. Thanks to the publisher for approving me to read and review this title on Netgalley. Every time I start a new book, I love diving into the world of another set of characters, in anticipation of the story waiting for me. With A Little Something Different, I was looking forward to it even more than most books because it’s such an original idea: a love story told from the perspective of everybody around them, everybody who knows the two characters should be together, except of course the two characters themselves. The concept sounded utterly romantic and charming and I was interested to see how it would work, or more so, I guess, if it would work. And it did. Sort of. But not really. Lea and Gabe are two students attending the same creative writing class. They also go to the same restaurants, order the same obscure Chinese takeaway, have similar quirky interests and end up in the same place at the same time all the time, no stalking necessary. They catch the eye of everyone around them; siblings, friends, classmates, lecturers, baristas, bus drivers etc – everybody is convinced they should get to know each other and fall in love, that they’re meant to be together. A Little Something Different is very distinctive in that it is told through fourteen different viewpoints, made up of people (and a bench and a squirrel) that are seeing this ‘thing’ between Gabe and Lea, even if they’re not feeling much themselves. What impressed me about the format this book is told in is that through everybody else’s eyes, Gabe and Lea’s characters are actually really well developed. We learn a lot about them both even though we’re not hearing from them and I was pleasantly surprised by that. I was a little apprehensive, thinking it would suffer from a bit of a dialogue overload else how would we know what Lea and Gabe were thinking? But mostly each individual character had their own take on their feelings for each other and I liked how they all had their own motives for being so involved in whatever it was going on, or not going on, between the students. For so many people to become so invested in the romance that doesn’t actually exist between Gabe and Lea, you’ve got to assume something pretty wonderfully romantic is brooding right? Or even some little sparks, a bit of attraction, or even for starters, a bit of communication… This was my big issue with A Little Something Different. I could not see anything between Gabe and Lea. Not a single thing. I don’t get what all these characters were apparently seeing. Gabe and Lea did not, to me at least, show any signs of being two people made for each other. They couldn’t even talk to each other. There was no connection. The majority of this book was spent trying to get them to say hi to each other and on the rare occasions they did, everyone telling the story was so giddy and excited like it was the most romantic thing in the world and they were finally about to fall in love. I say hi to old age pensioners crossing the street – it doesn’t mean I’m about to fall at their feet and declare my undying love. I’m just being polite and a little awkward. 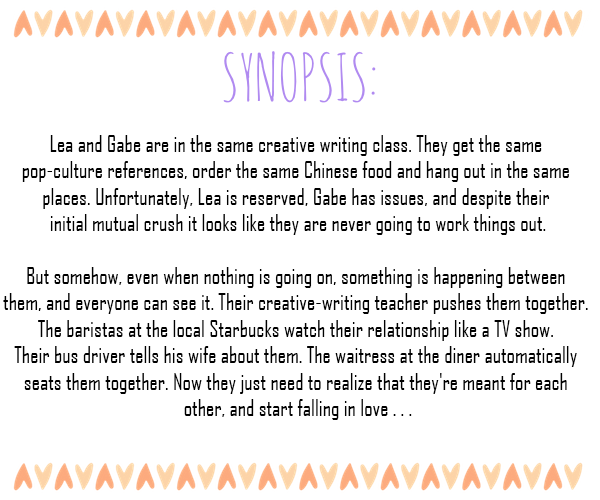 To me, there was nothing to Gabe and Lea other than being put in the same class together. And I found it frustrating reading how everybody else thought they were perfect for each other. I wanted, and expected, them to show the signs of two people who could so easily fall in love but they didn’t, and that’s when the book lost me. There were other aspects to this book that I did enjoy, honest. My favourite character was Gabe’s brother, Sam, who felt so real and genuine and just a nice guy who cares for his little brother but also acknowledges when he needs a kick in the right direction. The story told from Sam’s perspective was my favourite part. Sam was also vital in helping Gabe to connect with other people, to stop him from pushing others away and letting his past effect his day to day life more than it should. I liked Sam’s friends and how they weren’t afraid to show how highly they thought of Gabe without losing the kind of boyish nature you expect from guys of their ages. They were fun characters to read. I did like that the author seemed to have a good sense of humour in her use of a squirrel and a bench as storytellers. I know it sounds kind of weird – it was kind of weird – but who knew they could have so much character? It was odd but amusing and in truth, I was glad of their perspectives because I found I drifted off a little whilst impatiently waiting for anything to happen between Gabe and Lea. The idea of A Little Something Different is something quite new to me and it’s told in a way I’ve personally never read before. I appreciated the originality but in truth I wanted the story to be cute and romantic and for there to come a point when I wanted to bang Gabe and Lea’s heads together to make them see that they could fall in love with each other, not because I was just sick of hearing them both drone on and on and on. A cute concept written with originality but one which I thought could have been so much more and instead ended up a little flat. As you say the idea sounds great. I love your description of saying hi to an old man. Such a refreshing and honest approach to reviewing.